Better late than never, right? 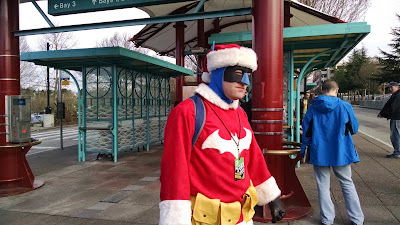 Here are some action shots from Bat-Santa wandering around Emerald City Comic-Con. Also, read about how the suit was built here! Bat-Santa prefers the cold, too. Kryptonite from his utility belt, tied with a bow. Just a couple of dark anti-heroes hanging out. Bat-Santa remains on patrol, and we at Mainlining Christmas are relieved to have him on the job.